A decadent dish for a miserable Sunday morning with howling winds and driving rain. No Sunday papers for us today, as neither of us wanted to go out in this weather. This would work equally well as a nice starter at a dinner party too. The recipe is not dependent on accurate measurements, just grab a handful of this and some of that. Peel and grate the potatoes, chop the onions finely and mix with the salt, pepper, caraway seeds and egg. Spray a large baking tray with Fry Light and place half a dozen blobs of potato mixture on the plate, pressing them down to form small pancakes. Spray well again with Fry Light and bake at 200°C for 15-20 minutes, until nicely browned. Keep an eye on them and turn the heat down if necessary. Cut the salmon into thin strips. Give the quark a good stir and add some water if necessary to give it a nice, smooth consistency. 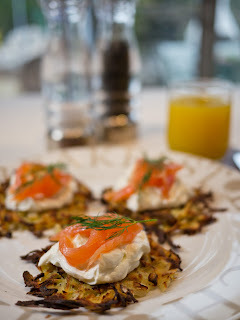 Serve three pancakes on each plate, top with the quark and arrange the salmon strips over the top. Decorate with a sprig of dill on each. Even the husband, who is not a great lover of smoked salmon, commented how nice this was. The plates were won in a raffle at my local Slimming World club.